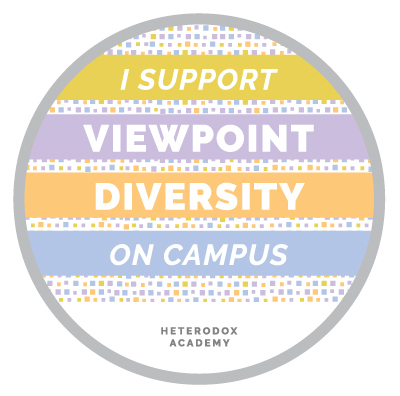 Heterodox Academy seems well intentioned in a No Labels, “Can we all get along?” sort of way. And of course viewpoint diversity is AN important aspect in the battle against the leftist Fascism (but I repeat myself) that has overtaken not just campuses but all of Western culture. But it is by no means the only aspect. And arguably it’s not even the most important one. Viewpoint diversity is of little use if a significant percentage of viewpoints are based in illogical, cognitively distorted, thinking. They left a word off the end of that statement. The K-16 (and beyond) education system actually DOES teach students HOW to think. It teaches them to think precisely as Haidt and Lukianoff describe in Coddling: with, and through, cognitively distorted “emotional reasoning.” It teaches students not how to argue, but rather how to slur, as Haidt described on the Charlie Rose TV show. This aspect of K-16 education is arguably the greatest single cause of the problems Heterodox Academy claims to have been founded to confront. Any effort like Heterodox Academy that claims to want to improve social science and academia should focus less on the sizzle of viewpoint diversity and more on the steak of the elements of disciplined, critical thinking. Less on the WHAT and more on the HOW. Less on the outcome and more on the process. Heterodox Academy, if it wants to be effective, should develop a set of learning objectives, class materials, lesson plans, and tools that teachers at all levels of the education industry in America could use to teach the basics of thinking well. If students were taught basic rules of argumentation and evidence then many of the problems associated with the absence of viewpoint diversity would evaporate. Without that, the chief benefit of Heterodox Academy seems that it makes its members feel good about themselves. Actual progress in the battle against anti free speech Fascism seems merely a fortuitous side effect rather than a primary objective. « Stop conflating ideology with government.